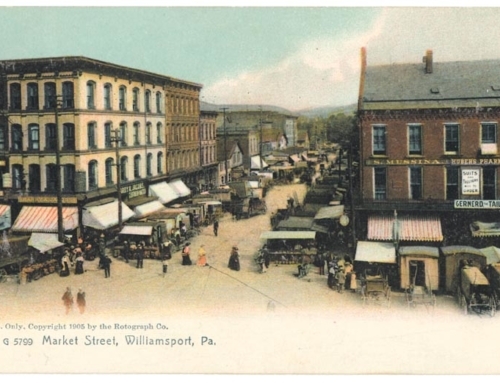 Williamsport has always been the most important crossroads community of Northcentral Pennsylvania. This strategic position has yielded many visits by important and distinguished personages, among these several U.S. presidents, vice presidents and presidential candidates. Before he became president, the only native Pennsylvania president, James Buchanan is said to have visited Williamsport on several occasions. On May 28, 1892, the 23rd president of United States, Benjamin Harrison, visited here on his way to Rochester, N.Y. to dedicate a monument honoring that city’s Civil War dead. Theodore Roosevelt later came to Williamsport on October 26, 1914, five years after he left the presidency. Roosevelt campaigned here for Gifford Pinchot, who running for senator on the Progressive Party ticket. A parade headed by the Repasz Band honored Roosevelt’s presence. Former President William Howard Taft visited the city during World War I to assist on the Liberty Bond campaign. He was met with great enthusiasm and his visit yielded much treasure for the Liberty Loan campaign. Less political purposes lured Herbert Hoover here on May 16, 1928. He was Secretary of Commerce at the time and would be elected the nation’s 31st chief executive that fall. But he came to the area for the rest and relaxation of a fishing trip. He came back two years later, as president on May 31, 1930 on his way from a speech in Gettysburg. 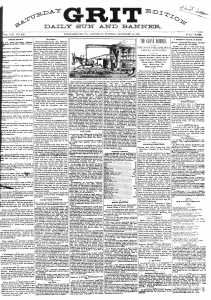 He stopped briefly in Williamsport and was met by enthusiastic crowds before going to the Ogontz fishing lodge on Larry’s Creek in Cummings Township. “Give ’em Hell” Harry Truman twice campaigned in Williamsport and stopped here on train whistlestop tours. He campaigned locally in October 1948 and for Democratic Presidential candidate Adlai E. Stevenson in 1953. Future President Lyndon B. Johnson appeared in Williamsport on October 18, 1960 while campaigning as the Democratic vice-presidential nominee. Governor David Lawrence, Mayor Thomas Levering and various County Democratic politicos met him. Vice President Hubert Humphrey campaigned here for president in 1968. On April 17, 1976 Jimmy Carter, who was running for the Democratic nomination for president, stopped in Williamsport on a campaign appearance. He was elected president that fall. In 1980 George Herbert Walker Bush, the Republican candidate for vice president and later as the 41st president appeared at the Little League Baseball World Series. His son George W. Bush appeared as president at the 2001 Little League Baseball World Series.